Always on the lookout for something interesting and different when it comes to jewelry, Karin Collins' SpoonFed Art certainly caught my eye. 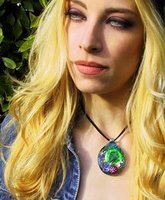 This LA-based designer transforms spoons into eye-catching, punky pendants. Each pendant is handmade from a real spoon and comes on a black or white suede cord necklace like the ones pictured. The pendants are easily transferred to your own necklaces, chains or pins to create other unique looks. Being handmade all pendants are unique, and simply gorgeous. You'll definitely stand out in the crowd with one of these beautiful handmade jewelry pieces. I highly recommend that you visit SpoonFed Art and browse through the extensive collection of beautiful designs. As well as being able to purchase online, if you're in the Los Angeles area, SpoonFed Art is available at a number of locations, check the SpoonFed Art website for store details. For the entire month of August get 10% off at Spoonfed Art!